Up until recently, split-residency tax cases almost always ruled against the taxpayer. This was often because the spouse asserting nonresidency did little or no planning. They took a job out of state, moved into a new place, and hoped they weren’t audited. They did little or nothing to sever their contacts with California to make it clear their residency had changed, even if their spouse remained a California resident. In fact, most of the cases of split residency favoring the taxpayer worked only because the nonresident spouses argued they were separating and their marriage was essentially over, rather than that they were intending to continue a marriage between a California and non-California spouse. For split residency to survive an audit (and it is more likely to get audited in high-income situations because the FTB will in many cases be aware of the couple’s gross income from the resident spouse’s California tax return), you have to plan meticulously in two areas of residency law. First, it has to be unambiguous that the nonresident spouse is not a California domiciliary (a different concept than a resident). 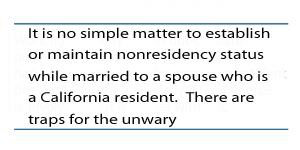 Second, the nonresident spouse has to make sure visits to the California spouse are “temporary or transitory” – or put another way, that the California spouse’s home isn’t the other spouse’s principal residence. These terms take some parsing. Generally, the rule is, if you are domiciled in California and you leave for “temporary or transitory” purposes, you remain a California resident, subject to California taxes on all your income. Conversely, if you are not a California domiciliary and you come to California for a temporary or transitory purpose (say, to visit your California-based family), you don’t become a resident. So what is a domicile? Unlike residence, domicile is defined for tax purposes as your permanent home, the place where you have your most settled and permanent connections, not merely for a limited purpose such as going to college or working, but as a “fixed abode” (the term often found in case law). It is the place where, whenever you are absent, you intend to return. So, you can be a domiciliary of California even while your residence is elsewhere. The two are often the same, but not necessarily so. Domicile can make a big difference in a split-residency marriage. If a California couple decides one of them will take up residency in another state or country, they usually have to be scrupulous about changing domicile first. That’s because where a taxpayer’s family resides is a weighty factor both in determining residency and domicile. If there is any ambiguity, the FTB will conclude the non-California spouse remains a California domiciliary and is only living out of state “temporarily.” If this looks something like a vicious tax circle, it probably is. What Is Temporary And Transitory? “Temporary and transitory” is itself a legal term of art, and not necessarily intuitive. What the FTB deems short-term or non-permanent is not necessarily what lay people think. A job overseas under a multi-year contract is potentially temporary if it appears you will return to California after the term runs (in one case, the contract was for seven years and the FTB still found it to be temporary). And one factor the FTB particularly focuses on is where the taxpayer’s spouse and children live. If they live in California, we return to the vicious circle. This doesn’t mean couples can’t successfully assert separate residency. It does mean they have to be systematic about making sure the nonresident spouse has a domicile outside of California and that the trips to California do not look like time spent at a principal residence. This means registering to vote in the home state (and actually voting), availability for jury duty, registration of vehicle and licensing, and making all the connections you might expect for a person who considers the state in question his fixed abode, including buying or renting a home where you keep the type of personal effects expected in a principal residence, and which you report as your principal residence for tax purposes. Once domicile is established out of state, it mean severing as many contacts with California as possible to indicate change of residence. This may take some thought and create some inconvenience, especially if you are moving from California and your spouse is remaining, and especially if children are involved. Your visits to your California spouse’s home must look like visits, not the other way round. Assuming a married couple successfully establishes separate legal residency status, they face various challenges in preserving that situation. One of them is what might be called “vacation home creep.” “Creep” here doesn’t mean you’re acting like one; it means that the nonresident spouse has to be careful to treat visits to a California spouse’s home like he is on “vacation,” a “temporary and transitory” visit. If it looks like the nonresident has moved into the California home and is living there, then for tax purposes that’s exactly what the FTB will conclude. This same problem often occurs with vacation homes. Seasonal nonresidents (snowbirds) often enjoy their California vacation homes so much, they begin to spend more and more time here and fill them up with items associated with the center of their lives (family heirlooms, art, good clothing, etc. ); until one day the vacation home looks more like their principal residence than a break from everyday life. It’s all the more likely to happen where the “vacation home” is the place where your spouse and children live. For this reason, nonresident spouses have to be vigilant in keeping the center of their lives in their non-California home and to avoid slowly moving their important personal items to their spouses’ residence. Another trap for the unwary (and it is a big one) is how California treats community property for tax purposes. Married California couples usually file joint state returns (it’s generally required if they file joint federal returns, and most do). But if they file separate returns, half of each spouse’s community property must be reported on each return. The reason is obvious: under California law community income belongs to each spouse equally. So if one spouse makes $1,000,000 and the other makes $100,000 (assuming the income is all community and not separate), each will report $550,000 on a separate return (50% of the total $1,100,000 of community income), and pay taxes accordingly. This makes sense for California residents. But what if one spouse leaves California and sets up residency in another state? Will the nonresident spouse still have to file tax returns reporting his share of the community property? The answer is, if a nonresident spouse moves to a community property state (or country), yes, he has to report 50% of his California spouse’s community income on a California nonresident return (Form 540NR). And his California spouse must report 50% of his community income on a California return (Form 540). To use the figures above, this means that if the nonresident makes $1,000,000, the resident spouse reports $500,000 of that on a Form 540, plus $50,000 of income (50% of the community income earned in California). The nonresident spouse has to file a Form 540NR reporting $50,000 of his spouse’s income (50% of the community income earned in California), because even as a nonresident he has to report and pay taxes on California-source income. As you can see, this rule can wreak havoc on any tax savings anticipated from moving out of state. The benefits are essentially cut in half. To add insult to injury, all the zero income tax states nearest to California are community property states – Nevada, Texas, Washington. The non-community property states with no income taxes are far afield – Florida, Wyoming, South Dakota, Alaska (which is actually an opt-in/opt-out community property state). Being that far away from a spouse living in California often makes the split-residency marriage somewhat problematic when it comes to logistics. But it can be done for those willing to endure the inconvenience and cost of far-flung matrimony. There are special rules to determine whether a couple with separate residency are allowed to file separate returns at all (it usually requires them to file separately at the federal level) and what the nonresident’s income threshold for reporting in California is. If the nonresident state is under non-community property rules, an entirely different tax analysis applies. Accordingly, careful tax planning involving the nonresident state is required before any decision is made to assert separate residency. Note that this problem arises only if the couple’s income is actually community, regardless of whether the nonresident spouse lives in a community property state or not. By default, it will be if they both reside in community property states. 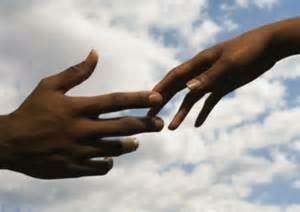 However, if they have a valid prenuptial agreement characterizing their income as separate, the problem vanishes. And even if they don’t have a prenup, it’s not necessarily too late. The couple can enter into a marital property agreement with the same goal. With a prenup or postnup in place, the nonresident spouse can live and work in a community property state free from California tax entanglements. That said, postnups are notoriously hard to negotiate if there is a large disparity in the spouses’ earnings. The spouse with lower income has to relinquish substantial rights in the marital income to make this level of residency tax planning work. Typically, creative family law lawyering is required to protect that spouse’s financial well-being by some other means. Finally, spending significant time in California, even on “vacation,” always comes with the risk of generating California-source income by working here. It’s almost inevitable that people work while vacationing in a modern economy. If the nonresident spouse isn’t retired, and if he isn’t careful, working remotely while visiting his California spouse could create a tax obligation without him knowing it. See Working While Vacationing: The Perils of California Source Rules for Nonresidents. To summarize, married couples have the right to opt for separate residency status. This can lead to large tax savings if carried out in compliance with California tax laws. But to get that benefit and to keep it requires careful planning, not just driving to a bachelor pad across the state border.